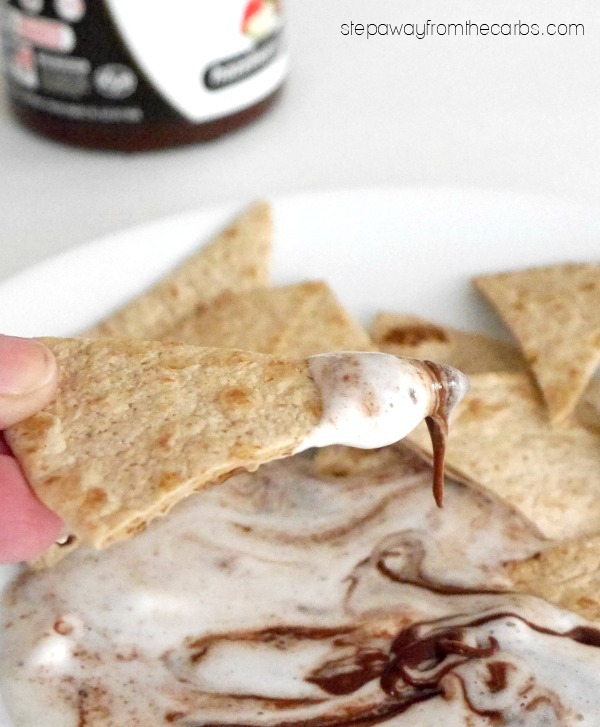 This sugar free marshmallow fluff is absolutely amazing! 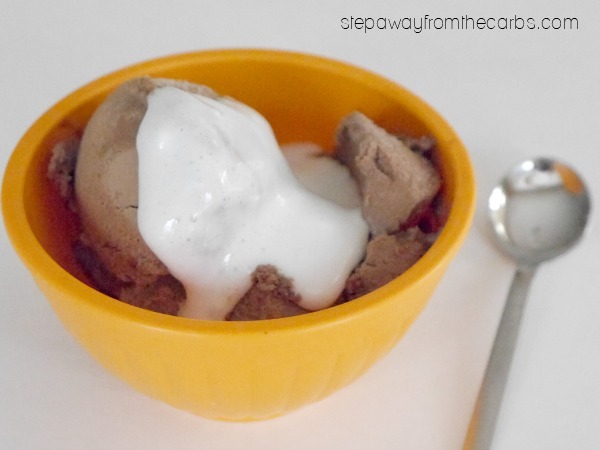 Try it on low carb ice cream or tortilla chips! I did a quick taste test – and there is definitely no aftertaste! There are many recipes that I could make using Tagatose (especially baking ones, because it will brown like sugar), but I decided to REALLY put it to the test, and make some marshmallow fluff – but a version that used sweetener. I had no idea if it would react the same way as regular sugar – and I was in for a very pleasant surprise – because it turned out really well! To make the sugar free marshmallow fluff, add some unsweetened gelatin powder and a little water to the bowl of a stand mixer and stir together. Add the tagatose, more water, sugar free honey and vanilla extract to a saucepan (this was the first time that I’d tried sugar free honey – the flavor is pretty good and it definitely has a honey texture!) Bring to a rolling boil and use a candy thermometer to check that the temperature is at least 238F. Start the stand mixer and gradually pour the hot syrup over the gelatin. Keep beating to let the mixture cool down. Speed up the stand mixer and beat until the gorgeous white marshmallow fluff has formed – this takes about 10 minutes but it is definitely worth it! Oh and a quick note about storage – I’ve tried keeping the “fluff” at room temperature and in the fridge, but it DOES tend to crystallize either way. But the solution is simple – just scoop out what you need into a bowl, and microwave it for just a few seconds at 50% power – and the soft texture will return! Please note: Like any sugar alcohol, Tagatose may have a laxative effect with excessive consumption. One of the classic uses for marshmallow fluff is Fluffernutter – where it is mixed with peanut butter. 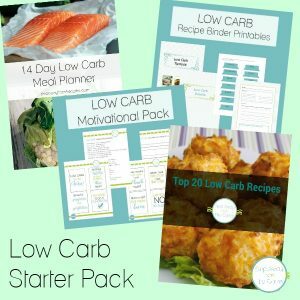 Now I’m not a fan of peanuts, but I bet you can come up with some low carb way of combining these two ingredients! 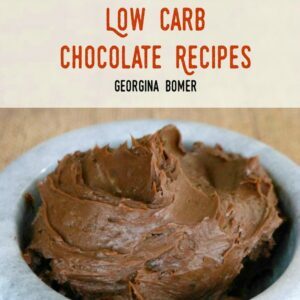 Frosting for cookies or cupcakes – it would be amazing over my low carb Double Chocolate Muffins! And let’s not forget – just eating it with a spoon! MAN this stuff tastes good! Now, the observant ones among you may have noticed that I haven’t mentioned the carb count of Tagatose yet. This is for a good reason, because they are actually quite tricky to work out. Let me explain. Tagatose is unusual in that while it is a sugar, the body treats it as a sugar alcohol (or polyol). It is only partly digested and the remainder is treated as a fiber by the body. But exactly how much is treated like a fiber is hard to calculate. Officially, the carb count is listed as 4g per teaspoon, with 0g fiber, which is pretty much the same as regular sugar. If you don’t include sugar alcohols when you count carbs (opinions vary on this) then you can consider Tagatose to be zero net effective carbohydrates. If you *do* count them, your job is harder. The makers of Tagatose say that they err on the safe side with the nutrition label and don’t list a fiber count, because they cannot be specific and don’t want to be misleading. SO. 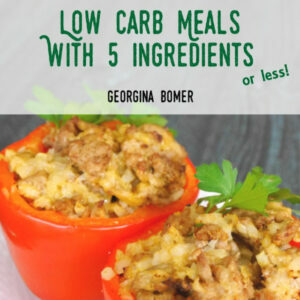 If you make this recipe, it very roughly makes 12 servings of about 2 tablespoons each. IF you count the carbs in Tagatose completely, you’re looking at 8.5g net carbs per serving (which is 1.5g less than commercially bought Marshmallow Fluff, but I appreciate that it is still high). If you don’t count *any* carbs from the Tagatose, the count is only 0.5g net carbs per serving. In reality it’s somewhere between the two. Add the gelatin and 2 tbs water to the bowl of your stand mixer and stir together. Add the sweetener, remaining water, sugar free honey and vanilla to a saucepan. Bring to a rolling boil and use a candy thermometer to check that the temperature is at least 238F. Start the stand mixer and gradually pour the hot syrup over the gelatin. Keep beating to let the mixture cool down. Speed up the stand mixer and beat until the marshmallow fluff has formed, about 10 minutes. 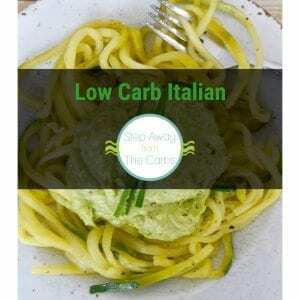 See main post for detailed carb count information. Nutritional data is approximate, and does not include sugar alcohols. I have used a similar recipe and continued to beat the fluff for 20 min or so and put it in a pan coated with cornstarch and it made marshmallows! Cut and dust with more cornstarch. What about Weight Watchers Smart points? How would you figure that? I’m very sorry, I have never followed a Weight Watchers system, so I have no idea how to calculate points. i live in mississippi. where could i find those ingredients, such as the suger free honey, tagatose, and unsweetened geletin powder? thank you! I have included links to online sources of these ingredients in the main text of the post. Let me know if you have trouble tracking them down! I haven’t tried it I’m afraid – I don’t tend to have Splenda in the house these days as it doesn’t agree with most people. If you try it, please let me know. Good luck! Splenda is padded out with maltodextrin, to equal sugar in bulk. I find it’s that which disagrees with my incredibly fickle digestive system. For some of us, the issue is not the feature ingredient, but all that other crap (fillers, gums, etc). You can buy liquid Sucralose (the actual sweetening ingredient in Splenda) at many places. I get mine at Capella Flavorings. Yeah, you can’t replace sugar cup for cup, so you have to get more creative, but a few drops go a long way. I’m practically no-carb now and can drink black coffee, but cocoa is just too bitter. I just made a divine cold brew “bulletproof” mocha and 3 drops overcame the extra bitterness of the cocoa. But I guess I do need to put gelatin on my list of ingredients to trial and see how they affect me. I keep seeing it used in all sorts of neat recipes, like yours. Particularly since I know all the gums give me troubles. Double for chicory root, inulin, etc. No sugarfree honey available even online. Do I really need it? Or can something else work? Oh that’s annoying! Do you have Amazon where you are? Maybe try there. I haven’t tried the recipe without honey, I’m afraid – but if you try it, let me know! I purchase sugar free honey at y local Walmart. Honey Tree makes it and I love it. You should be able to find it along with the other jars of honey. Hope this helps. Good Luck. Do you think I could use this to make fudge??? I’m honestly not sure about that, sorry!